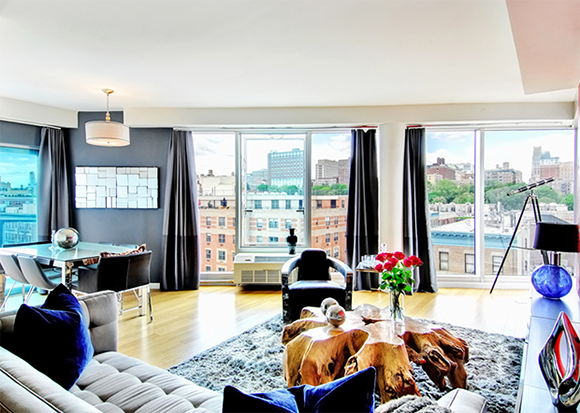 Living room at a luxury apartment at 57 Reade Street. Zumper's February’s Rental Report has been released, and its data revealed New York City’s rental market is still second only to San Francisco in its fierce competitiveness and monthly rental price. While 1- and 2-bedrooms are up 7.3 and 3.1 percent, respectively, from last year, February was a slightly less expensive month than January, showing a 1.8 decrease for 1-bedrooms and a 2.4 percent fall for 2-bedrooms. Photo: Living Room at 37 Great Jones Street, a luxury rental building in NoHo. We all know moving is a huge stressor, and even if you are financially well off, the monetary burden of moving can be quite significant. Two leading factors that make buying a home in the long term seem the better choice than renting are cutting back on the number of times one needs to move, along with the perceived investment opportunity. In a recent study compiled by the Douglas Elliman appraiser, Jonathan J. Miller, housing prices in Brooklyn are skyrocketing at a rapid rate. And in some instances, Brooklyn apartment rentals have been more costly than their Manhattan counterparts. Manhattan may still reign supreme as the priciest rental market in the city, but Brooklyn’s rental costs are actually growing at a faster rate. Rents are soaring throughout NYC as supply is dwindling. Rent prices are on the rise again, with the median rent up 4.1 percent ($4,093) compared to last year, writes Curbed. Jonathan Miller, compiler of Elliman Report has found that the prices for smaller apartments are now rising faster than the top of the market. In Manhattan, the median price for studios and one-bedrooms is $2,270 - that’s 11 percent up from last year, the highest point in seven years! Brooklyn and Queens rent rates are also going up, though at a much steadier rate. The real question is: why are smaller apartment rents going up? As advances in engineering permit taller and more impressive buildings, architects have a similar opportunity to showcase new works and interpretations of the cityscape. Tenants of rent-regulated apartments in New York City will soon have to write out larger checks to their landlords—the Rent Guidelines Board recently approved an increase of at least 4 percent in the rents of the million or so people who currently live in rent-regulated apartments across the city. Starting October 1st, one-year leases for rent-regulated apartments will see a rent increase of 4 percent, while two-year leases will see a rent increase of 7.75 percent.